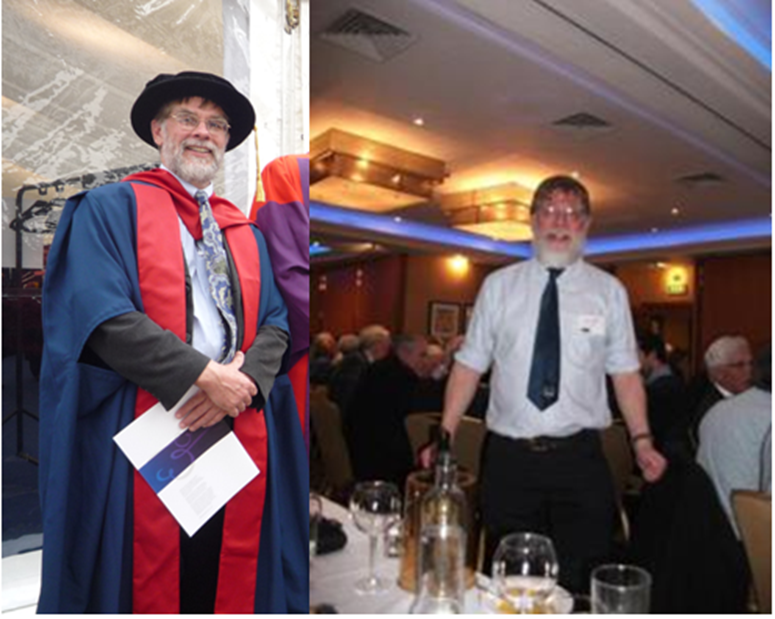 Is there a dress code for scientists? 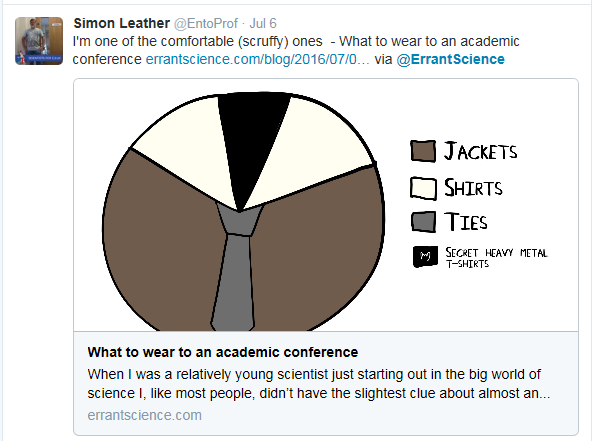 A couple of weeks ago, Mathew Partridge*, who writes at Errant Science posted a blog about what to wear at an academic conference. 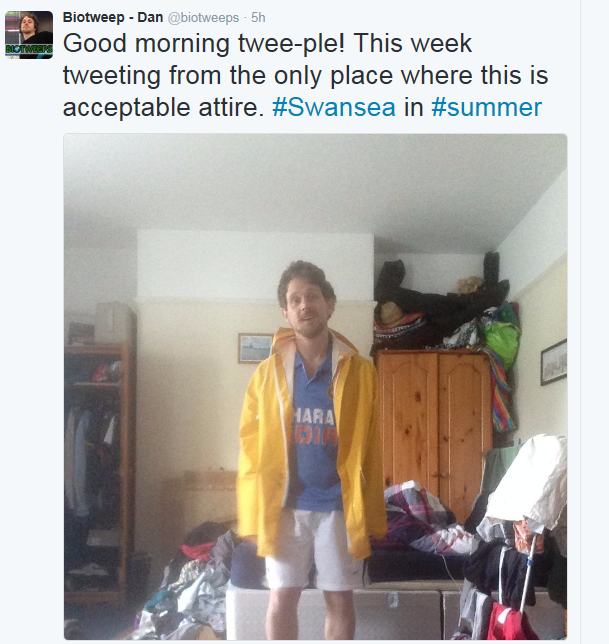 I tweeted the link to his post, adding that I was one of the scruffy (comfortable) ones. This generated a few comments, the more thoughtful of which suggested that what to wear at a conference might be affected by more than comfort and one of my female Tweeps made a very good point about not adopting a too simplistic viewpoint to the matter. It was not necessarily all down to feeling comfortable, different rules may apply to different people. Amy Parachnowitsch over at Small Pond Science, has also written about this apparent dichotomy between male and female scientists’ approach to conference wear. As I sat down to write this I logged on to Twitter to find the conversation shown above and came face to face with this photograph from the then curator of BioTweeps, zoologist, Dan Sankey who tweets as @inspiredanimals, which reinforces the stereotypic male academic ‘scruff factor’. Part of my teaching involves a lecture to the MSc students about how to give a good talk, be it a job interview, a conference or as part of an outreach programme. As well as the usual tips about content and delivery, I also cover dress and ask “Is there a dress code?” The answer to which of course, is “yes and no, it depends”. So what do I mean by this? The secret to giving a good talk, leaving aside having good content and being well prepared, which gives you the confidence to stand in front of an audience, is to feel comfortable in yourself. I am firmly convinced that unless you feel comfortable, your talk will not be as good as it could be. There are two aspects to feeling comfortable, one is knowing your stuff and feeling that you can handle any questions that might be put to you. The other is feeling that you are relaxed (as much as you can be when standing in front of an audience) and comfortable in yourself. I firmly believe that as people, we should be accepting and not judge people by appearances, but rather on who they are inside. Yes, I know this is difficult, because as humans, we all have some prejudices***, no matter how hard we try to overcome them. As scientists, we should be even less swayed by appearances as we are trained to look at data impartially. When I was being interviewed for academic jobs, I was faced with a bit of a dilemma. I was not just out of a post-doc or graduate school. 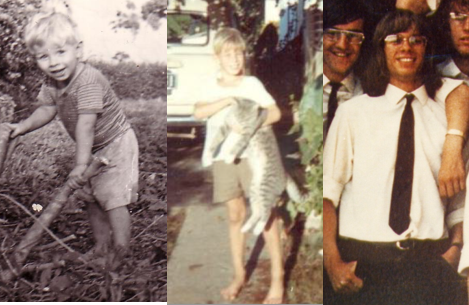 I was an established scientist and was being interviewed by panels including people I knew quite well, who had seen me at conferences and knew how I dressed in a professional setting, in my case, jeans, shirt-sleeves and desert boots. So, if I turned up for an interview in a suit (I don’t own one) and tie, they would know that I was pretending to be something I certainly wasn’t. On the other hand, if I turned up in blue jeans and shirt-sleeves, they might assume that I wasn’t taking it seriously. I thus compromised but salved my conscience at the same time; I wore black jeans, a new pair of desert boots and a crew-neck sweater, that way the panel could assume I was wearing a tie and if they didn’t look too closely, that I was wearing proper trousers and not jeans. 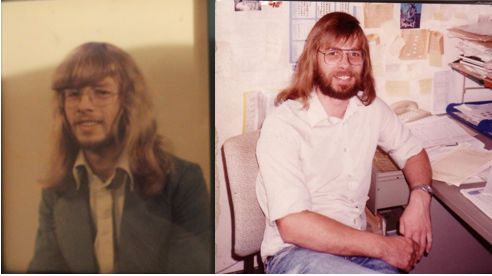 On becoming a university academic and having kids in school, I did get my hair cut, although my dress style remained stubbornly, desert boots, shirt sleeves, jeans and corduroy jacket. I must confess that in my first term of teaching, I did wear chinos, but soon reverted to jeans as I just did not feel comfortable. The New academic, short-lived chinos and shortish hair. But I digress, back to being comfortable and giving a talk. I tell my students that the dress code is up to them. How comfortable do they feel? If they feel that the expectation of the audience or interview panel is that they should be dressed more formally than their every-day dress, then they, as the interviewee, will feel more comfortable and more confident if they make some compromise in that direction. As a prospective employer or supervisor, it doesn’t make a difference either way as I hope that I always judge by qualifications and ability and not by appearance. 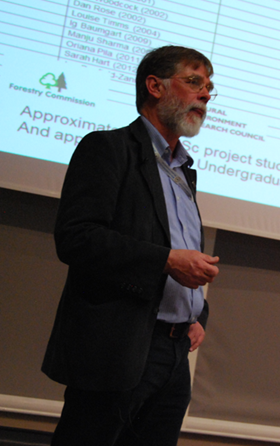 As a presenter at a conference or as advisor on a government committee, I always assume that I have been asked along for my expertise and not for my fashion sense so even for my inaugural lecture I adopted my usual relaxed style. 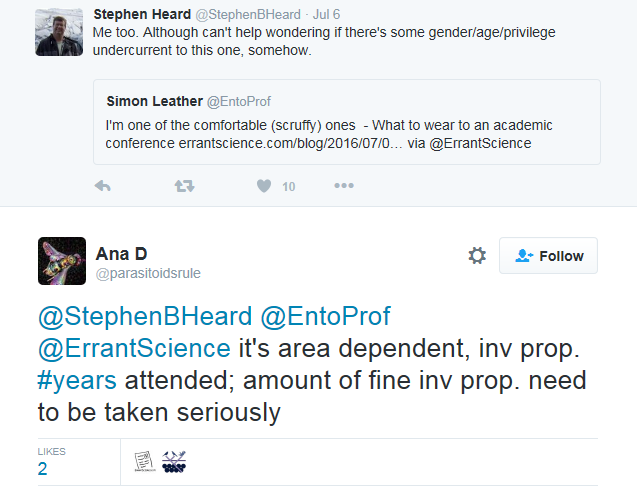 I freely admit that I am somewhat privileged, I am white, male, older than a lot of people and a senior academic, I am at that place in my career, where I can, if I wanted to, pretty much ignore convention, but there are certain situations where that would make me and my audience feel uncomfortable or discombobulated. 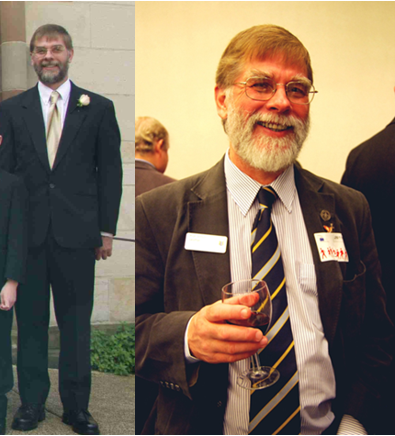 There are thus occasions when I do wear a tie, some are one-offs, such as my eldest daughter’s wedding (she hired a suit for me and her brothers) and when we launched the Centre for Integrated Pest Management at the European Parliament in Brussels. Although I firmly believe that I do not judge conference presenters and attendees by their appearance, there are obviously people out there who do and apparently, as shown above and below, female scientists**** feel that they are judged in this way. As someone who is happily married to a lady who eschews make-up and revels in her natural highlights (she is going grey) I am perfectly at ease with the concept of dressing to please yourself and not the audience. On the other hand I do not think that a presenter who dresses more formally for their talk, than when listening to others talk, should be looked down upon or indeed judged in any way. If that makes them feel more comfortable, then that is their choice. And if you are unsure about what your prospective employer or audience expect, being smart rather than scruffy is to err on the safe side. I would like to think that male ecologists and entomologists have similar views to me, but perhaps we should be asking ourselves, why it is that female scientists in particular, feel that they are being judged by how they look and if it is caused by male bias and/or female peer pressure. I suspect that it is a bit of both, but welcome all comments. Very formal dress and ‘smart casual’ for the Verrall Supper. The drink helps. **for those of you not familiar with the Swansea University campus, it is almost on the beach. ***in my case, I find tattoos and other examples of self-mutilation, e.g. body piercings (including ear rings), cosmetic surgery, high heels, and even hair dying, very hard to understand, but I hope I do not let it interfere with my judgement of the quality or worth of the work of that person as a scientist or a human being. ****and possibly those from other disciplines too, but I have no evidence, anecdotal or otherwise. I follow the “being smart rather than scruffy is to err on the safe side”. I completely agree with the idea of wearing smart/dark jeans as an alternative to the smarter suit options (e.g. at conferences). 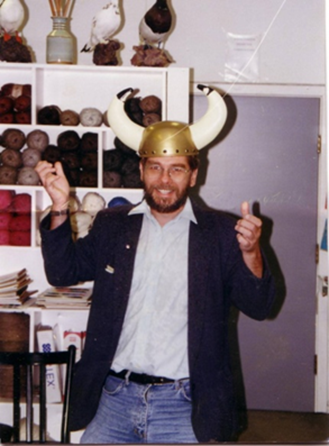 Moving from the dress code in the office/conferences to the field – I found when surveying at farms, that old shirts and jeans were the option of choice otherwise I was misidentified as a lost holidaying 18 year old. We do not FEEL this. There is an entire sub-discipline of psychology that looks at how people are influenced by the appearances of others. And study after study shows that people (both men and women) all judge women more harshly than men, and this is particularly true in professional settings. Thanks Margaret – very interesting. Yes I agree that there are a lot of people out there who make that initial judgement on appearance and then find it hard to re-calibrate. I am not a paragon of virtue and I confess that my initial reaction to piercings and tattoos (be they borne by a female or male) tend to be negative. Once I meet/hear the person though, then my appraisal is by the content rather than the cover. I am also perhaps a little different than other white males in that I am inherently biased towards the good sense and abilities of females. I have always deferred to my female PhD students when it comes to decision making about running my lab and whom to appoint, although of course this does not mean that I ignore what the male members of the group have to say. Also, I was seven when Jamaica gained its independence and I know at first hand the bewilderment and hurt that one feels to be judged entirely on your skin colour. My brothers and I were frequently spat on and called names by Jamaicans of colour. Initially this led to resentment and anger, but as I grew older I became more understanding. Perhaps these early experiences were instrumental in making me more appreciative of content than cover? I have no doubt that you consciously try to treat people equally, but we all have unconscious bias. That means that we judge people — without realizing it. And we tend to unconsciously judge groups that are traditionally seen as “inferior” more harshly. Nobody is immune. several years ago. And it changed my way seeing the world. I also thought I was fair and equitable and believed that I only judged scientists by the content of their science. 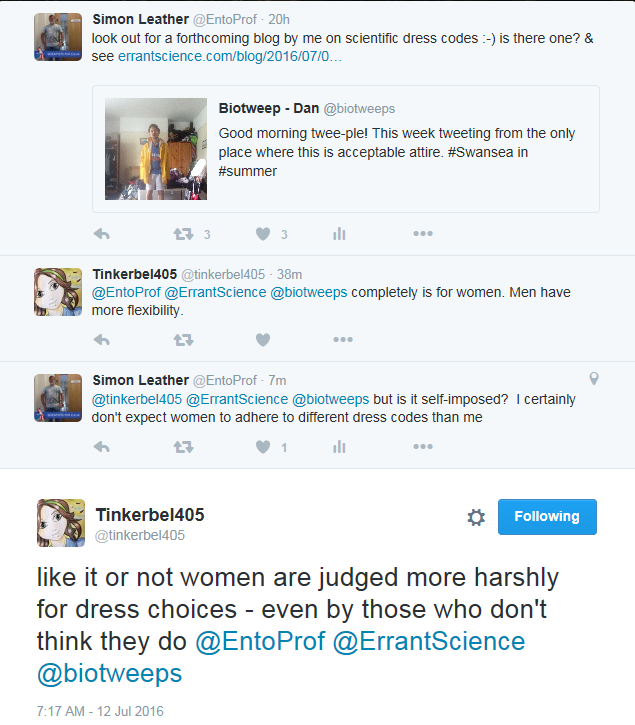 But I found that I have a persistent bias against women in science, even though I AM a woman in science. I’m sure I have other biases too. I try very hard to be aware of them, as awareness of your own biases is the only way to effectively counteract them. I thoroughly enjoyed this blog – thank you for sharing it. I’m afraid I don’t share your aversion to ties, and I worry you are missing out. Having been invited to a couple of black tie events in my life, I can confirm that, no matter how ordinary you look in real life, wearing black tie makes you feel like James Bond. And if you wear a real one, you can undo it at the end of the evening and look like Tony Bennett. But I digress. I take your point entirely about being comfortable. But the main (the only?) point of talking at a conference is to communicate ideas. It follows that anything that gets in the way of that is a bad thing. If you are dressed in such a distracting way that most of your audience are thinking “What was he/she thinking of?” you aren’t communicating effectively. I could do a talk hopping on one leg and talking like a pirate because I feel more comfortable that way, but chances are it would obscure the science I’m trying to explain. I’d always advise new speakers to dress like, or even better, slightly more formally, than your audience. Looking reasonably smart shows you are serious. Save making a sartorial statement for the bar in the evening. I’m definitely in the scruffy camp! Great post, Simon.